Numerical weather prediction models are not able to resolve explicitly those processes which are smaller than the grid scale of the model, thus these processes have to be parameterized. Parameterization means the description of the overall effect of a given subgrid scale process on the grid scale values, using the given grid scale variables. Practically, this means that a model with 2.5 km resolution is unable to resolve e.g. the near surface turbulent eddies, however, it is important to describe the overall effect of these eddies using the grid scale vertical temperature gradient and the wind shear. The main features of the physical parameterizations used in the regional and mesoscale models of OMSZ are described in the following. Convection refers to the atmospheric process when a warm and consequently lower density air parcel moves upwards due to buoyancy. In the case of deep convection the vertical motion is so intensive that it produces precipitation. The condensation in the clouds produces latent heat which intensifies the vertical motion, until cloud tops reach the top of the troposphere. Consequently, in severe thunderstorms cloud tops as high as 10-12 km can be observed. Over continental areas of the mid latitudes models need a horizontal resolution of at least 2-3 km to resolve deep convection explicitly. The AROME mesoscale, non-hydrostatic model as applied at OMSZ has a horizontal resolution of 2.5 km, thus it is assumed that this model resolves deep convection explicitly. The regional scale model ALADIN is run at 8 km resolution at OMSZ, consequently, deep convection has to be parameterized in this model. Currently, in the ALADIN model the ALARO physical parameterization package is used. This package uses a mass flux scheme to parameterize deep convection. Mass flux schemes consider all the convective updrafts in a given grid cell as one single updraft. The time evolution of the mass flux of this single updraft is determined by the lateral mass exchange with the environment and the horizontal moisture convergence. The advantage of the ALARO mass flux scheme as compared to classical schemes is that it can be used in the so-called gray zone (3-8 km horizontal resolution) as well, when part of the deep convection is explicitly resolved by the model and the other part has to be parameterized. Shallow convection refers to the warm updrafts (thermals) which originate from the surface and reach the top of the planetary boundary layer. These thermals are usually indicated by small non-precipitating clouds (Cumulus humilis). Until recently, shallow convection was parameterized separately from turbulence in numerical weather prediction models, however, nowadays in the ALADIN and AROME models these two processes are handled in a unified way, although details are different in the two schemes. The turbulence parameterization of the ALARO package, which is used in the ALADIN model, is a 1.5 order closure, which carries a prognostic equation for turbulent kinetic energy (TKE). This scheme is able to describe the small eddies, however, it is not able to handle the non-local effect of large shallow convective thermals. Therefore, current developments focus on including these non-local effects in the 1.5 order turbulence closure. The AROME model also applies a 1.5 order closure for the description of boundary layer turbulence, however, for the parameterization of shallow convection it uses the mass flux approach. The turbulence scheme and the mass flux scheme are coupled through the surface fluxes. As the mass flux scheme is closed using the surface sensible heat flux. Phase changes occurring in clouds are described by the microphysical parameterization. The schemes used in the ALADIN and AROME models show large similarities. Both schemes carry six prognostic microphysical variables (vapor, cloud water, cloud ice, rain, snow, graupel), and describe the phase change processes among these variables. In the AROME model this means 35 processes (Figure 1). The parameterizations distinguish warm-cloud and mixed-phase processes. Warm-cloud processes are autoconversion, accretion, evaporation, sedimentation, while mixed-phase processes are nuleation, ice-crystal autoconversion, aggregation, raindrop contact freezing, riming, melting, deposition, Bergeron-Findeisen effect and ice-crystal sedimentation. As mentioned above the ALARO parameterization which is used in the ALADIN model combines the explicitly resolved and the parameterized updraft. In this way it is able to handle both the updraft velocity and fraction and the microphysical variables generated by the updraft prognostically. Afterwards, the microphysical processes are computed regardless of the origin of the variables (grid scale or parameterized). The microphysical parameterization of ALARO is simpler than that of AROME, the described processes are autoconversion, aggregation, condensation, evaporation, freezing, melting and sublimation. The advantage of prognostic microphysics is that as opposed to other hydrostatic models this scheme is able to “remember” the processes of the previous time step. The parameterization of radiation processes is an important, but computationally rather intensive part of numerical weather prediction models. In these schemes the short-wave radiation (which is coming from the Sun) as well as the long-wave radiation (emitted from the Earth's surface and air molecules) has to be described. For both processes the diagnosis of cloud cover is of major importance, while for the long-wave scheme the distribution of ozone and aerosols is also needed. These distributions (as the models are not calculating chemistry prognostically) are derived from climatological datasets. The AROME model applies for the parameterization of both the short-wave and the long-wave radiation the RRTM (Rapid Radiation Transfer Model) scheme which is also used in the global model of ECMWF. The ALARO package uses the slightly modified version of the ACRANEB scheme, which has previously been applied in the ALADIN model. 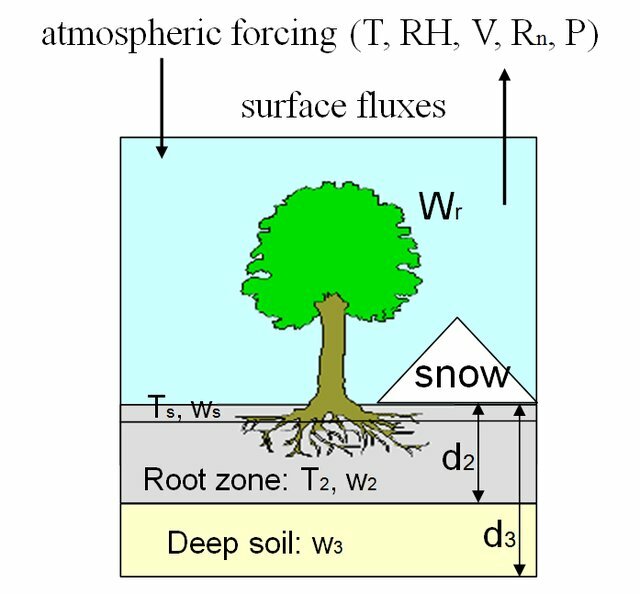 The surface scheme, which describes the interaction between the surface, biosphere and the atmosphere, is an important part of every numerical weather prediction model. In the AROME model the SURFEX scheme is used, which is part of the Meso-NH French research model. SURFEX is a so-called externalized scheme, which means that it can be used with different atmospheric models after the programming of the appropriate interface routines (which provide the atmospheric forcing). SURFEX distinguishes between four tiles (land, town, sea and inland waters), for each tile a specific parameterization is applied to compute surface properties, which are then used to compute the surface turbulent fluxes of heat, momentum and water vapor. Over the nature tile the ISBA (Interaction Soil Biosphere Atmosphere) scheme is applied (Figure 2), which describes the time evolution of soil temperature and moisture, and handles the effect of vegetation on evapotranspiration. The width and density of snow cover is also handled prognostically. Over urban areas the TEB (Town Energy Balance) canyon scheme is used, which distinguishes three surfaces (wall, roof, road), describes their temperature evolution, and handles the radiation processes which are typical for urban areas (e.g. shading effects). The submodels of SURFEX which describe inland waters and sea are currently inactive in the AROME version which is applied at OMSZ. 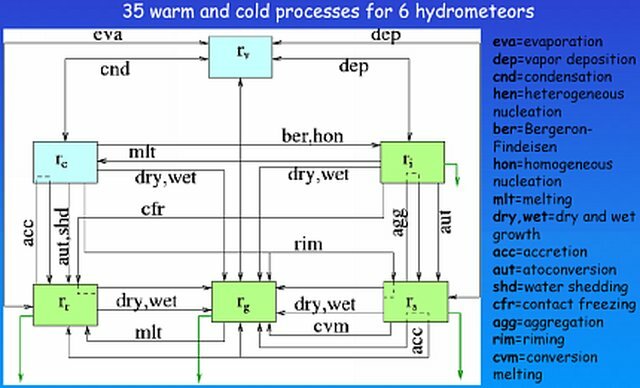 Over water bodies the model is run with a constant surface temperature (which is initialized from measurements), while roughness is calculated with the Charnock formula. The surface scheme of the ALADIN model is similar to the schemes applied in AROME over nature and water surfaces, however, it does not contain the urban and the lake submodel. It has to be noted though that the coupling of the ALARO package and the SURFEX scheme is an ongoing development.